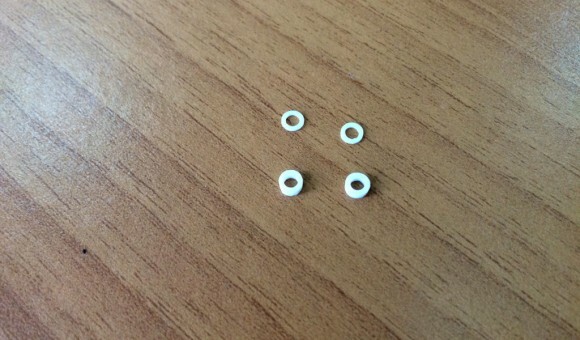 A set of 3D printable spacers for the front knuckles of the Kyosho Mini-Z MR-02 and MR-03 RC models. These are used for regulating the height of the front suspension as well as limiting the maximum travel of the car’s wheels. We have the spacers available in three different sizes in order to help you get finer tuning ability, so here are spacers height 0.5 mm, 1 mm and 1.5 mm. You can also combine multiple spacers to get the desired height adjustment. Make sure you use finer resolution for printing these out as they are quite small and need to be precise, we have used 0.1 mm layer height for a great result. Also you might need to lower the extrusion speed a bit while 3D printing the part for best results.